A further analysis of the Hugo Nomination data from 2016 suggests that a great number of Rabid Puppies refused to vote to nominate the so-called "hostages." In particular, only 61 out of 400 voted to nominate File 770 for Best Fanzine. This suggests the hostage strategy doesn't work well for the slates. Last week, we published an analysis of Slate Voting over the past three years which used the EPH data to get more accurate estimates of how many Sad/Rabid Puppies had participated in the Hugo Nominations in 2014, 2015, and 2016. Because that tool showed very few Sad Puppies used their recommendation list as a slate in 2016, it's possible to use the same tool to divide the Rabid Puppies into two different slates: one "hard" slate, which voted the way people were instructed to, and one "soft" slate, which omitted the "hostages." The hostage strategy appears to have been to nominate some mainstream works/people in hopes that either a) those people would withdraw, allowing the slates to claim they had the power to force people they don't like off the ballot or b) the fans would vote those people under No Award in the final ballot, allowing the slates to claim that the fans are the ones who vote mindlessly or c) one or more of the works would win, allowing the slates to claim an actual victory. You can read the previous article to see how well that turned out. A key assumption in that strategy was that the legions of people who vote for slates really do vote mindlessly. But the graph below shows that this is not the case. Red represents the number of hard-core Rabid Puppies in each category. These are the folks who nominated everything on the slate in that category and didn't nominate anything else. Orange are the soft-core Rabid Puppies. They also nominated solely from the slate, but they omitted the "hostages." The list is sorted by number of soft-core Rabid Puppies. We'll discuss the interesting categories in that order. In the Best Fanzine category, we estimate there were only 61 Rabid Puppies who nominated all five items from their slate for Best Fanzine, but 329 of them nominated four of the five, excluding File 770. The Rabid Puppies are an alt-right, white-nationalist group whereas File 770 is a Liberal fan site whose comment section is relentlessly critical of the Rabid Puppies. It was asking quite a lot of them to nominate File 770, even as part of some master plan, and, clearly, most of them couldn't bring themselves to do it. Here we calculate 189 Rabid Puppies refused to nominate Penric's Demon for Best Novella. One can only speculate on what their objection was to either the work or the author, other than the fact that Lois McMaster Bujold is a woman. Certainly the other four nominees were all men, but it's also true that they had no problem nominating women in other categories. Perhaps they somehow knew she'd asked to be removed from the slate. And yet Alastair Reynolds was publicly vocal about not wanting his "Slow Bullets" on the slate, and yet it doesn't work to remove it from the Soft Slate. That is, the vast majority of hard-core Rabid Puppies seem to have nominated it anyway. Some people had suggested that Rabid Puppies would refuse to vote to nominate "The Builders," on the grounds that they wouldn't ever vote for anything published by Tor. We tried that experiment, though, and it didn't work either; it was broadly nominated. As described in The Curious Case of Best Professional Artist, the Rabid Puppy organizer made a last-minute change when he discovered one of his nominees wasn't eligible. Incredibly, with only 24 hours notice, all but 78 of the puppies successfully updated their ballots. This shows that they're quick, but it also shows that the previous two numbers cannot be explained by inattention. A good 70 Rabid Puppies appear to have been unwilling to nominate Seveneves for Best Novel. It's hard to ascribe any motivation here other than that it was common knowledge that the man didn't want to be on their list, even though, as far as we know, he never made a public statement about it. We estimate that 40 Rabid Puppies weren't willing to vote for Folding Beijng for Best Novelette. From this point down, the numbers are small enough that there's reason to doubt that they're meaningful, but it's fair to point out that it does seem odd for an alt-right group to be nominating a Chinese story. We calculate 29 Rabid puppies didn't vote for Toni Weisskopf for Best Editor Long Form. Again, this may not be a meaningful result, given how she has been such a cause célèbre for the puppies over the years. Still, one could imagine at least 30 Rabid Puppies who quietly resent so much attention going to a woman editor. We calculate 20 Rabid Puppies didn't vote for The Sandman: Overture for Best Graphic Story. That would likely have been a lot bigger if they'd known he was going to call them "sad losers" in his acceptance speech. Although the Rabid Puppy team can turn on a dime (as Best Professional Artist shows) they don't entirely vote without thinking, and they don't like being asked to nominate people who openly despise them--no matter what the strategy behind it. The method for calculation was pretty simple. We used the tool from Slate Voting Analysis Using EPH Data: 2014-2016 replacing the Sad Puppy slate with the Rabid Puppy Slate minus whichever work we had calculated as receiving the most organic votes. We then reran the algorithm and discarded any results that either a) found fewer than 20 "Soft Puppies" or b) resulted in a lower estimate for the total number of slate voters than the original estimate. As you can see above, even with 29, the results were a bit odd. These tables estimate the number of "organic" (i.e. 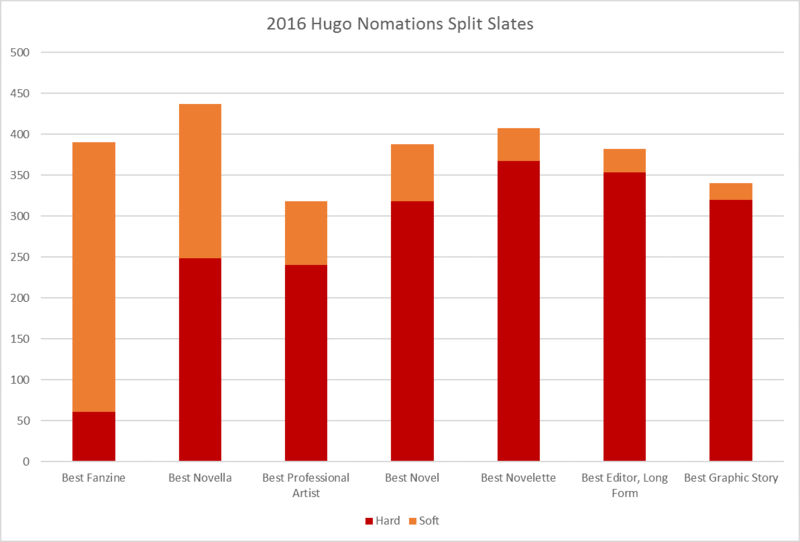 not part of an organized slate) nominations for the 2016 Hugo Awards. 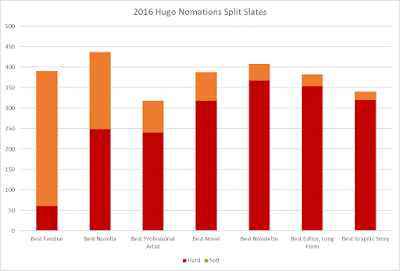 These numbers were computed from the 2016 Hugo Nominations Raw Data using the methods described in the Reanalysis of Slate Voting in the 2016 Hugo Nominations. 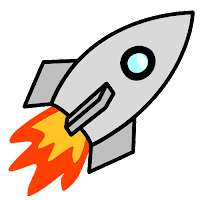 In this document, I use "vote" and "nomination" interchangeably; in all cases it refers to the number of votes received in the nominating round for the Hugo Awards. The first table summaries the numbers of votes from slates in each category. By the definition of slate that we're using, a slate voter within a category voted for every candidate on a particular slate and nothing else in that category. That means someone who voted for just one or two of the slated items counts as an organic voter in that category. The tables below are sorted by estimated organic votes, so they reflect the long list and finalists that we would have had if there had been no slates. This is somewhat conservative, since it only removes votes from perfect slates. The official winner of the Hugo Award is in bold. Any candidate that was in the official top five (whether it deserved to be or not and whether or not it later withdrew) is in regular type. In cases or ties and withdrawals, there may be more than five. All candidates which were not finalists are in italics. Any candidate which withdrew, declined, or was disqualfiied is struck through, provided this happened soon enough to keep it off the final ballot. Attempts to withdraw after the deadline are not marked. Blue marks candidates that were on one or more slates but which would have been finalists on the strength of their organic votes alone. Green indicates slate candidates who would have been finalists except that they withdrew or were disqualified in time to stay off the final ballot. Orange signifies slate candidates which owed their place in the list of finalists to their slate support, displacing candidates that would have otherwise been finalists. Red singles out spoilers which were later voted under No Award in the final round of voting. Magenta rows are slate candidates which failed to become finalists. Slate candidates which didn't even make it into the longlist are not shown at all. Gray marks candidates which were not from the slates, were not finalists, and would not have been finalists even without the slates. Estimated number of organic (non-slate) nominations the candidate received. Portion of the candidate's EPH points which were due to organic votes. Ratio of organic votes to organic points. Number of votes estimated to have come from Puppies who were strictly following a slate. Number of points assigned to this candidate by the EPH algorithm at the point where either the candidate was eliminated or the algorithm terminated with a list of finalists. Ratio of the total nominations received by the candidate to the number of EPH points. Look at the top items under any given category, up to the first double horizontal line. These are the finalists that Hugo voters would have been presented with had there been no slates--assuming the estimates are correct. Anything in italics above the double line is a candidate that was pushed out by the slates. Anything in blue is a slated candidate that didn't need their help. Now look below the first double line. Ignore things in gray italics; they wouldn't have been finalists even without the slates. Each orange or red line corresponds to a slated candidate that displaced an organic one from the top five. Pink lines are slate candidates that did no harm; they never made it to the finalist list anyway. Green items (always struck through) are nominees that would have been spoilers except that they were withdrawn. The second double line is the limit of the organic longlist. Items below this line received so few organic votes that they wouldn't have even been in the top 15 without slate support.